The first couple of days didn’t go as planned after the arrival of Koen and Gerhard. Koen fell ill and Gerhard and me capsized the boat in front of the beach. Nothing bad happened, just a bruised ego and a lost Gopro. Once Koen felt better we decided to start our journey. The box containing our gear didn’t fit for 3 rowers so we had to take turns, 2h row and 1h rest. It felt nice to take rest once in a while, although it is not relaxing in this extreme heat. 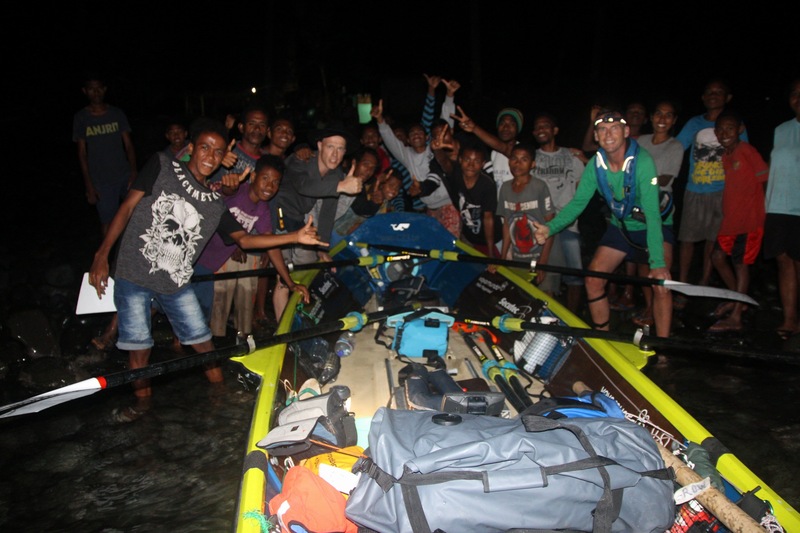 We started off pretty good with some nice progress till the end of Alor. There we were delayed for a day because we wanted the absolute right conditions for the 70km crossing to Wetar. After some planning we decided to row in the night, it’s much cooler then. After about 11 exhausting hours we reached the shore of Pulau Lirang. I had some difficulties keeping me awake while rowing. From there everything went difficult. We couldn’t camp on the beaches because it is full of crocodiles and all the locals warned us about that. The current in this channel is always going west in this season (according to the locals and it felt that way). We had a slow progress but the beauty of the rugged island made it more bearable, as well as the people who were always helpful to us crazy whites (Bule Gila). After wetar the next island was Kisar, a small island but was always to interest me during the preparations. Another hard day of 50km crossing but after all it went well. There Gerhard decided it is time to go back home. He has some issues with his back the last couple of days which seem to get worse. A good decision because from there he still had the opportunity to find transportation back. It was nice to row along with him and sad to see him leave. Koen and I set off after a rest day and saying goodbye. The next crossing seemed like an easy 50km to Pulau Liram but it wasn’t. A very demanding day with currents against us but the locals at Liram promise us that from there it would go east again. There it is Island hopping to the east, not very simple and we start to feel very tired. I must say this is a very demanding expedition, now I’m already here for 3 months and getting sick of it. The heath, exhaustion, being scared and so much more. Still I find a way to continue and push myself, luckily people sending me some messages of support which helps a lot here. Now writing this from an uninhabited island on the way to Pulau Babar.